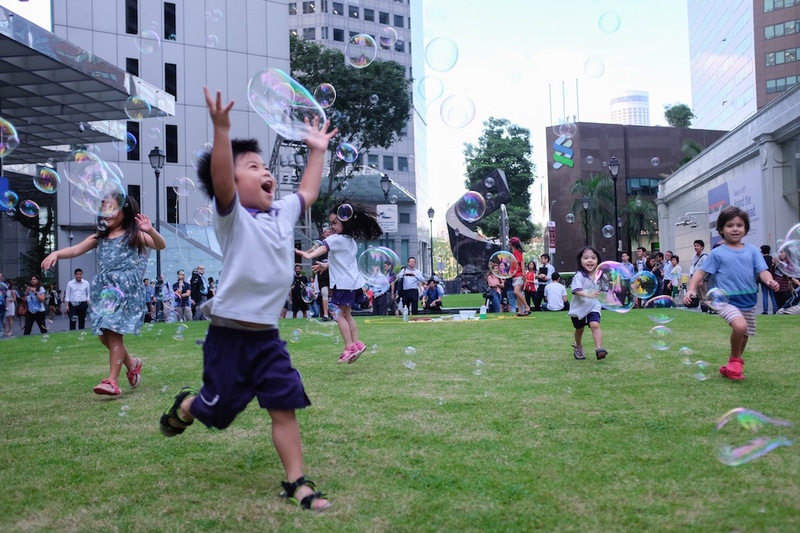 This photo of the kids playing with bubbles in Singapore was recently featured on Discover, so I thought I’d give you the backstory on the shot. It was Friday evening in Singapore and a very tall man was making bubbles with a big rope thingy. Rope thingy is the technical term, just so you know. Children would gather in front of him and as he’d lift the rope out of the soapy water, the wind would send huge bubbles floating down the lawn. The kids chased the bubbles with reckless abandon. I wanted a shot of the bubbles and the kids faces, so I had to get in the middle of the action. I plopped down in the grass and waited for the kids to run towards me. Sometimes the bubbles would drift to my left or right and I wouldn’t get anything. Once, when the bubbles came right at me, I got plowed over by a five-year-old girl who has a promising future in rugby. I shot in manual mode, with zone focus, so that I could concentrate on snapping pictures and not tinkering with focus or exposure. I took dozens of photos, most of them failures, which is often the case with moving subjects. And even though the boy isn’t perfectly in focus, I like this one the best because it captures the pure joy on his face. It’s a brilliant photo. And I totally get sitting down in the middle of it to get the shot. What do you mean by zone focus? I set the focus to about 10 feet in front of me, then waited for the kids to hit that “zone” instead to trying to focus and re-focus as they moved. Yeah, okay, good. That’s what I thought you meant. Love it! Great shot, great capture of a moment in time of such radiant happiness! Very nice indeed. The happiness comes shining through! Easy to see why it was featured. Congrats! Magical photo. I love it. Such a great capture Jeff! That’s a great strategy for trying to capture moving targets. I’ll have to remember that trick. I love this photo because you are down at their level and I agree about the look of joy of his face … plus the little girl, second on the right. Those kids were so happy! I was a little worried for them because they nearly ran into park benches and fell off ledges, but everyone was okay in the end. What a glorious capture of childhood! Jeff big congrats on being featured on Discover! Well deserved and as I recall you might be soon breaking double digit is with the recognitions from WP! Thank you Sue. This is the 5th time – thank you for noticing 🙂 It is always nice when it happens because I get comments from a broad range of people. Jeff I’m not sure it’s happened to anyone 5 times in the millions of WordPress users. Huge congrats and as always well deserved! I love seeing those happy faces! 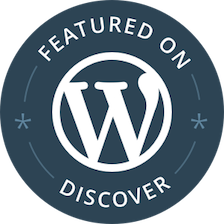 Congrats on being featured on Discover, Jeff! Shooting moving people is always a challenge for me, and I usually end up not getting any decent photo at all. I should try that zone focus trick and see how it works. Try zone focus with at least a 1/250 shutter speed. That should freeze those people! Will remember that! Thanks Jeff. Wonderful shot and congratulations on the feature!